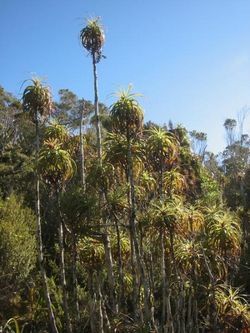 The Heaphy Track is located in Kahurangi National Park, at the north-west corner of the South Island. 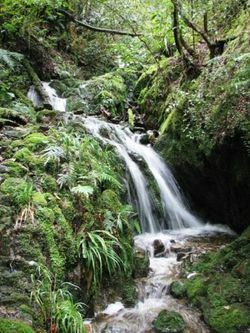 Established in 1996, Kahurangi is one of New Zealand’s newest national parks. At 452,002 hectares, it is also one of the country’s largest. Translated its name has a number of meanings, including ”treasured possession”. In places it is an untracked wilderness; elsewhere a network of tracks lets you explore wild rivers, high plateau alpine herb fields, and coastal forests. 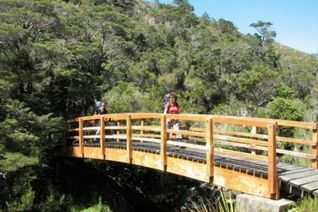 The Heaphy Track is the longest and most diverse of the Department of Conservation (DOC) Great Walks. Over 78.4 kilometres long, the track crosses the Park’s range of landscapes, starting from the junction of the Brown and Aorere Rivers, over expansive tussock downs, to the rivers, lush forests, nikau palm groves and roaring seas of the West Coast. Early pick up at accommodation in Nelson, and travel by minivan to Brown Hut (beginning of the track) for a final briefing, and the start of your walk. The track gradually climbs through podocarp and beech forest to Flanagan’s Corner (the highest point on the track, at 915metres). En route, grand views of Aorere Valley open up, with even Mt Taranaki visible on a clear day. From Flanagan’s Corner, it’s a gentle stroll on to Perry Saddle Hut. This is 880 metres above sea level. This is an easier day with only 4 hours walking. The track passes through kamihi and beech forest before reaching the wide expanse of tussock covered land known as the Gouland Downs. The track meanders down to Cave Brook, passing the famous ‘boot pole’, where trampers have tied their old boots. Past ‘the enchanted forest", a limestone outcrop with caves and waterfalls, we continue over the final part of the Downs and climb gently to Saxon Hut (16 bunks), our accommodation for this evening. The track crosses the Saxon River flats, then onto the broad ridge between the Gouland and Mackay Downs, passing old poles marking the boundary between Nelson and the West Coast provinces. The vegetation varies from tussock to shrub fringed beech forest with glimpses of the ocean and West Coast in the distance. We stop for a relaxed lunch at Mackay Hut. Beautiful views down to the Heaphy River mouth reward us here, before we set off again for the afternoon. The track descends gradually to the Heaphy River through beech and sub-tropical podocarp forest to the Lewis Hut, our destination for the evening. Today is another shorter walk; from Lewis Hut the track meanders along the banks of the Heaphy River, passing giant rata and kahikatea trees. 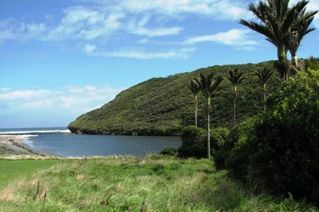 The Heaphy Hut, our accommodation for the evening, is situated close to the rivermouth and has prime coastal frontage! This is a truly magical spot. 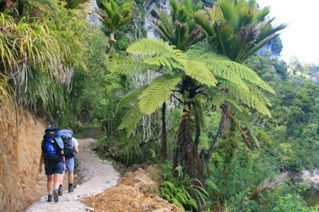 We walk from the Heaphy Hut along a coastline studded with nikau groves to the track’s end at the Kohaihai River. Some beach walking is possible at low tide. This is a spectacular coastal walk – rated as one of NZ’s best day walks – to complete your Heaphy adventure. Our van meets you at the Kohaihai River mouth, from where we transfer you back to Nelson. Many of New Zealand's bird species are threatened. Clients who walk the Heaphy Track are contributing in a small but significant way to the "Blue Duck Project", which aims to reduce predators around this bird's habitat.